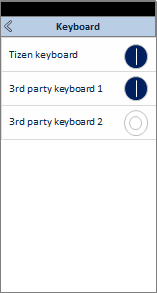 You can manage the input method editors (IMEs) installed on the device. After your IME application is installed, you can use the input method manager to open a list of installed IMEs, allow the user to enable an installed IME, and show an IME selector, in which the user can see the enabled IMEs and select one as a default keyboard. You can open the installed IME list menu. If a new IME has been installed, the user can see its name in the IME list, and can use the toggle button to enable the keyboard they want. All keyboards enabled in the IME list are shown in the IME selector to allow the user to select them as the default keyboard. You can open the IME selector menu. When the user opens the IME selector menu, it shows all the keyboards enabled in the IME list. 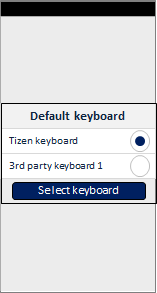 The user can change the default keyboard by selecting a new one. By clicking Select keyboard, the user can return to the IME list menu to enable a new IME. To check whether a specific IME is enabled, use the IsIMEEnabled() method of the Tizen.Uix.InputMethodManager.Manager class. As a parameter, use the application ID of the IME whose status you want to check. If the IME is enabled, the method returns true.